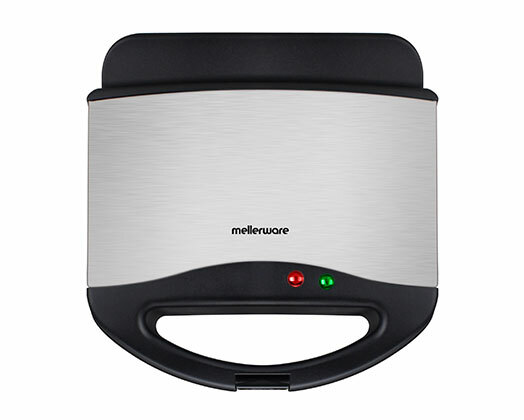 Home Products Mellerware Sandwich Maker 4 Slice Non-Stick Black 750W "Planet"
Mellerware Sandwich Maker 4 Slice Non-Stick Black 750W "Planet"
Mellerware brings you the Planet Sandwich Maker, perfect companion that not only looks good with its stainless steel finish, but puts food in your stomach too. Your sidekick in the war against hunger! The planet sandwich maker has a lockable lid, indicator light which lets you know when your sandwich is ready and triangular, non-stick grill plates to perfect those deep filled sandwiches! 2 slice deep fill sandwich compartments. Power & ready indicator lights.